A privy privacy shelter is a screen or structure that provides privacy, security, and dignity for the person using the privy. 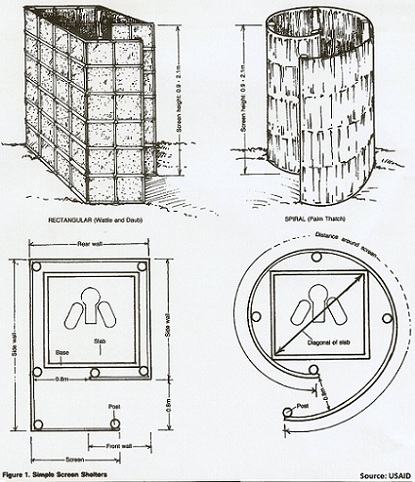 Depending on the design, a shelter can also protect the privy and the user from the weather and keep out flies, rats, scavenging dogs, and other pests. Designing a privy privacy shelter involves selecting the type of shelter; determining shape, size, and special features; and selecting materials, tools, and labor. (3) a detailed materials list. This web page describes how to design a privy privacy shelter and produce these three products. * a shelter with a roof and door. 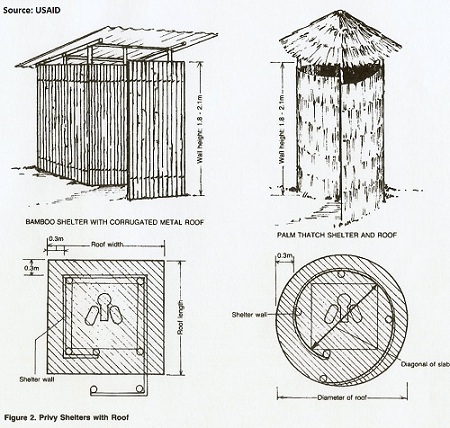 Figures 1, 2 and 3 show the types of privy privacy shelters. The most important factors in selecting a type of shelter are local customs and personal preferences of the users. Determine how much privacy people want and whether or not a roof and door are acceptable or desired. Other factors that influence selection are available money, materials, and skilled labor, and the extent to which control of pests is important. 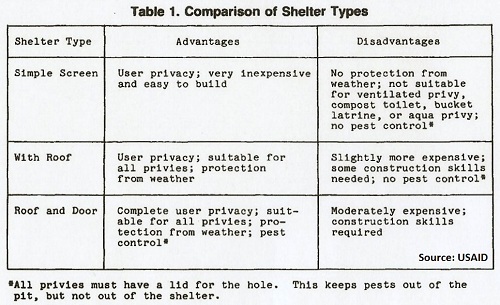 Table l compares these factors for each type of privy privacy shelter. The privy privacy shelter can be square, rectangular circular, or spiral- shaped, as shown in Figures 1 and 2, depending on local preference. The screen or walls should be vertical. The roof should slope to the rear or sides of the shelter to allow rainwater to run off. The area inside the privy privacy shelter should be 1.0 - 2.3 square meters. This allows enough room for the user without wasting building materials. Unless the privy is ventilated with a vent pipe, the shelter should completely enclose the privy slab. 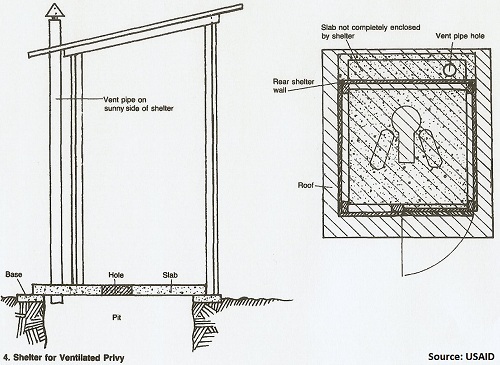 For a ventilated privy, the part or the slab that holds the vent pipe will be outside the shelter, as shown in Figure 4. The back wall of the privy privacy shelter should be 150-200mm from the defecation hole. The shelter can be designed to rest on the base around the pit with the walls bordering the slab. With this design, the size of the slab determines the area within the shelter. If the privy privacy shelter is a simple screen with no roof, the bottom of the screen should touch the ground. The screen can be 1-2 meters high. If the shelter has a roof, the walls should be 1.8-2.1 meters high to allow enough headroom. The walls should rest on the ground. 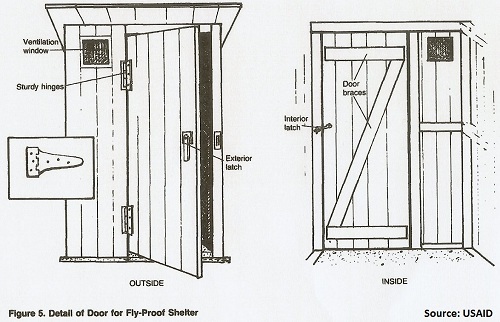 If the privy privacy shelter has a roof, it should also have ventilation openings. The openings should be at least 100mm by 200mm and spaced along the top of the walls. One design has the entire roof raised above the walls on the corner posts as shown In Figures 2 and 3. If the shelter has a door, it must have sturdy hinges to keep the door in the correct position. An inside latch is needed to keep the door closed when the privy is in use. 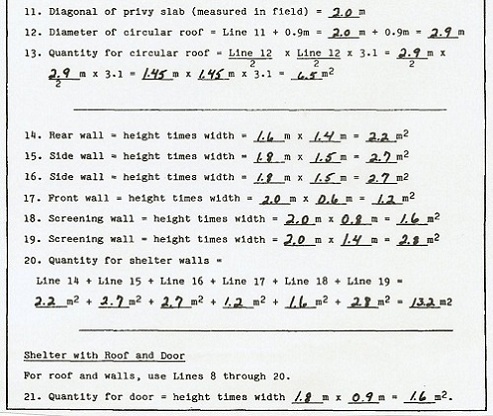 Figure 5 shows a well-designed privy door. The door may open from the right or left, but it should open outward unless this violates local custom. Ventilation openings are required. 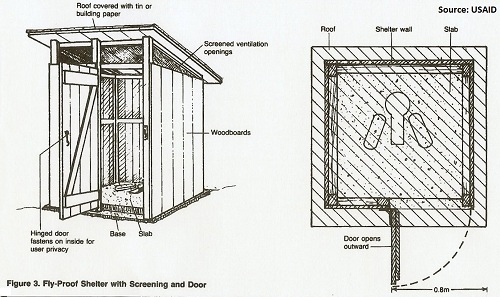 In order to keep pests out of the privy privacy shelter the door must fit tightly and screens must cover all ventilation openings as shown in Figure 6. 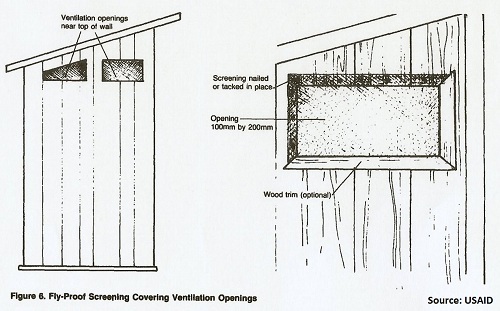 If the privy privacy shelter is for a ventilated privy, the vent pipe must be attached to an outside wall or to the roof, as shown in Figure 4. 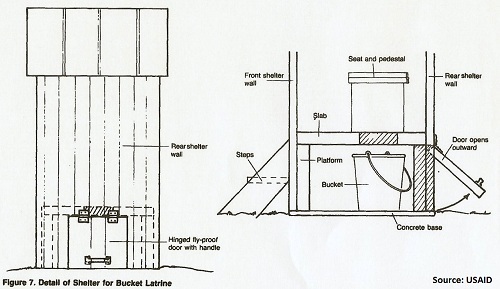 If the shelter is for a privy with a platform, such as an off-set pit, compost toilet, or bucket latrine, the walls should rest on the ground and enclose the platform. For a compost toilet or bucket latrine, the rear wall of the shelter must have a small door. It must be fly-proof for a bucket latrine and air-tight for a compost toilet. The door will allow for removal of the bucket or compost. This is shown in Figure 7. When the type of shelter, its shape, size, and special features have been decided, draw a plan view of the shelter showing all dimensions. Also prepare a detailed drawing of any special features. Give these drawings to the construction foreman before construction or the shelter begins. 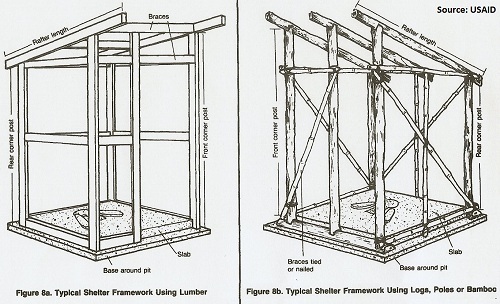 In general, a privy shelter should be built using locally available materials, tools, and labor. The sturdier the materials, the longer the life of the shelter. A simple screen shelter can be bamboo, palm thatch, mud and wattle, or poles supporting canvas or fabric. A shelter with a roof, or roof and door, can be built from a variety of materials. The roof should be water-proof. Depending on the area, termites may be a problem if wood structures are to be used. Special protection, such as a brick or concrete base, may be required to keep wood from coming into contact with the soil and giving termites access to the wood. 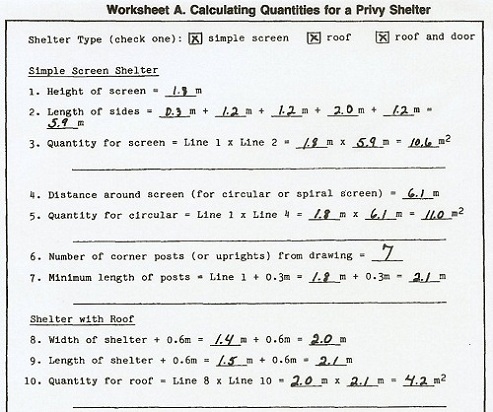 The quantities of materials needed depend on the type and size of the shelter. Most quantities are calculated in square meters and then converted to material units such as numbers of bricks, numbers of bamboo poles, and numbers and lengths of boards. Other quantities are determined by measurements made on plan view drawings. Materials include screening material and corner posts, or an upright post for a circular or spiral screen. Calculate the amount of screening material needed by adding the lengths of each section of the screen and multiplying the total by the height, as shown in Figure 1. For example, suppose the height of the screen is 1.8 meters and the lengths of the sections are 0.3 meters, 1.2 meters, 1.2 meters, 2.0 meters, and l.2 meters. See Worksheet A, Lines 1, 2 and 3. For a circular or spiral screen multiply the distance around the screen as shown in Figure 1, times the height. A corner post is needed at the end of each section of screen. Count the number of posts in the plan view. In the example above there are seven posts as shown in Figure 1. The post near the center of the longest section is for added stability. For circular or spiral screens, place upright posts 0.9-1.2 meters apart. Posts should be 0.3-0.6 meters longer than the height of the screen. This extra length will be driven or buried in the ground to hold the screen securely. multiplying the width of the shelter plus 0.6 meters times the length of the shelter plus 0.6m. To calculate the quantity of materials for a circular roof, which may be desirable for a circular or spiral-shaped shelter. First obtain the diagonal dimension of the privy slab by measuring it, as shown in Figure 2. The diagonal plus 0.9 meters is the diameter of the roof. The quantity of materials equals the diameter divided by 2, multiplied by the diameter divided by 2, multiplied by 3.1. 2.1 square meters x 3.1 = 6.5 square meters See Worksheet A, Lines 11, 12, and 13. Wall materials are calculated by adding together the area of each wall, including the screening wall, if there is one. The area of a wall is its height times its width. If the top of the wall is sloped, use the height in the middle. For a circular or spiral-shaped shelter, the area of the wall is calculated the same way as for a simple screen shelter. That is, the distance around the shelter is multiplied by the height. See Worksheet A, Lines 14-20. The materials needed for cross poles, corner posts, rafters, and foundations, shown in Figures 8a and 8b are best calculated by drawing an accurate plan view and measuring lengths from the drawing. The length of each log, pole, or board used for the foundation equals the width of the wall it supports. The length of each corner post or upright equals the height of the wall it supports. If the entire roof is to be raised above the walls for ventilation, add 0.15 meters to the length of each corner post or upright. The materials needed for the roof are the same as those just discussed (see worksheet A, Lines 8-20). Additional materials needed for the door are door braces, hinges, and latch. Door materials are calculated by multiplying the height of the door times the width. The quantities of materials for the door braces are best obtained by drawing an accurate plan view similar to Figure 3 and measuring lengths from the drawing. One inside latch and two hinges are needed. The skills of the laborers and the tools needed depend on the materials used. For example, a wooden shelter requires a laborer with some carpentry skills and a hammer, saw, and nails. A brick-and-mortar shelter requires a laborer with some masonry skills and a shovel, mixing container, and trowel. When the materials, tools, and labor requirements have been determined, draw up a materials list and give it to the construction foreman. In summary: give the construction foreman design drawings similar to Figures 1 through 8b and a materials list. Return to "Introduction to Sanitation Facilities, Part 2" from "Privy Privacy Shelter"